What can I do with the output of a Gage study with only one part? How can I use the variance component estimates to obtain meaningful information about my measurement system? By themselves, the variance component estimates from the ANOVA output for a Gage study with just one part are not particularly useful. However, if we combine what we’ve learned about the variance for Repeatability and Reproducibility with some additional information, we can obtain a significant amount of information about our measurement system. We will also need to do some simple hand calculations. So, what other information will we need to get meaningful information about our measurement system? If we have a historical estimate of the standard deviation for the Part-to-Part variation, we can get an estimate of the total variation and %Contribution. From there, we can work through a few hand calculations to obtain most of the information we would have obtained had we done a full Gage R&R. We can also obtain some useful information about our measurement system if we use the process tolerance. 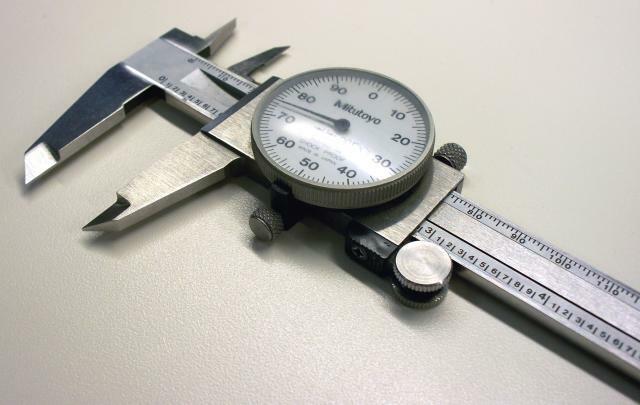 Using the tolerance, we can get an estimate of the %Tolerance for the total gage (which is interpreted using the same guidelines as %Study Variation). The way to proceed with the estimates of the historical StDev or the Tolerance is best explained with examples. Let’s assume that we’ve conducted a Gage study with one part and three operators by following the instructions in the article referenced above. Let’s also assume that the data are arranged in the worksheet as shown below; the estimated variance components from the session window output are also shown below. The reproducibility is 0.06278 (the variance component for Operator), and the repeatability is 0.01730 (the variance component for Error). As a first example, let’s assume that the historical standard deviation for part to part is 1.0853. The total variation is the sum of the variance components for the part-to-part variation, for repeatability and for reproducibility. Not bad! Most of our variation is attributable to the part-to-part variation, which is desirable in a good measurement system. What else can we learn? 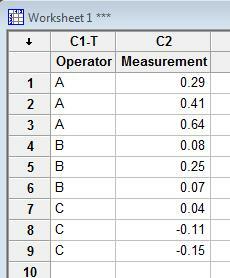 Here we can see that Operator A’s measures are higher than B’s, and B’s are higher than C’s. 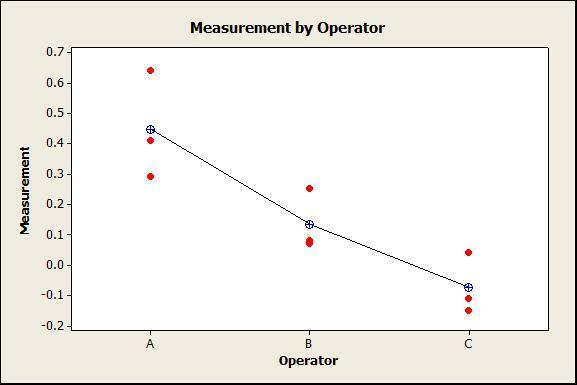 In the graph above, the vertical points for each operator represent the repeatability, and the measures across operators represent the reproducibility. This is really useful information—if we arrange the table as above the result is a close match to what we could obtain from Minitab for a full Gage R&R. In Minitab, the result of the distinct number of categories is truncated so if we’d analyzed our Gage R&R in Minitab for multiple parts, the number of distinct categories would be 5 for this example. So, if we have an estimate of the historical standard deviation for the Part-to-Part variation we can get a lot of useful information about our measurement system. But what if we don’t have the historical StDev? What if we only have information about the tolerance? Of course, the results of the StudyVar/Tolerance were multiplied by 100 to obtain the percentages.